I think I’m in love. As part of National Eating Disorders Awareness Week (more food for me), Galia Slayen created a life-size doll representing what Barbie would look like if she were a real person. 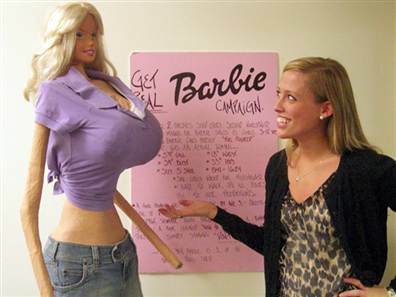 Barbie’s measurements are 39/18/33, so I don’t see what the problem is. She’s not going to dominate the conversation, has a flawless complexion, and look at that rack. We just need the guy from Edward Scissorhands to make some hands for her that aren’t scissors and my future wife is ready. Yeah, I like to hold hands because I’m a romantic. Barbie, come holler at me in The Suite.